Developers can now register for one of the biggest gaming conferences of 2018. Game developers can now register for GDC 2018. The conference will run from March 19-23 with the Expo taking place on March 21-23. 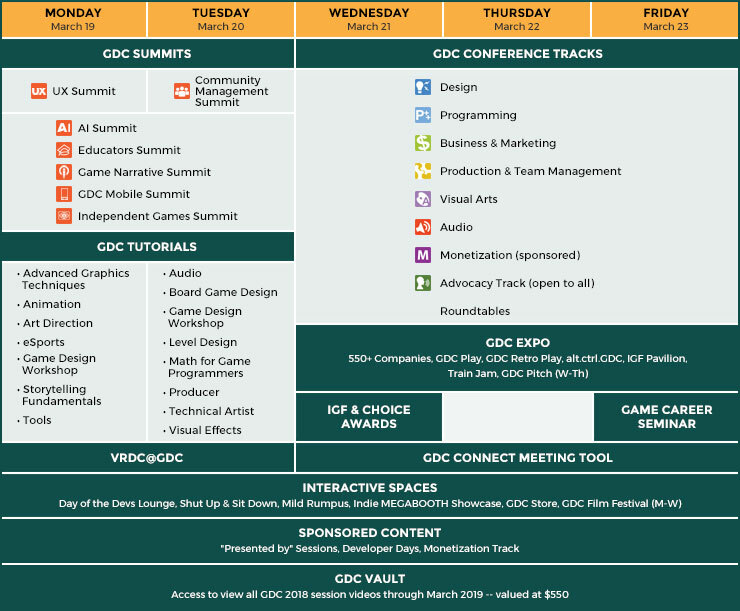 Check out the a detailed GDC 2018 schedule here. There are a ton of different passes to choose from. Prices range from $149 all the way to $1949 for folks who buy passes before January 31, 2018. They only go up from there, so act fast if you want to attend. Here is some more information on GDC 2018 pass pricing. There is an option to add VRDC@GDC to a GDC Conference+Summits, GDC Conference, or GDC Summits pass for $400. Register 10 or more people at the same time for select GDC 2018 passes and save 10% on the current price of passes included in your group. Find out more about GDC 2018 pass pricing, dates, and the schedule at the official GDC website. Just blocked out the time on my calendar. Hopefully I can go this time. so when is the shackmeet! I will be there demo'ng my new game Microtransaction: The Game. If you paypal me $1 I will let you look at screenshots. Just got acquired by EA for 100 million. Nevermind!